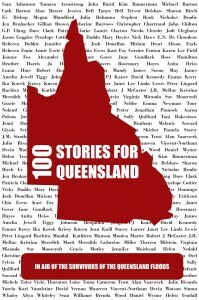 If you’re thinking of ordering 100 Stories for Queensland from Amazon, please do it tomorrow, Tuesday, the day of the chart rush. If enough people buy it on Amazon UK or Amazon US tomorrow, it’ll go to the top of the charts, encouraging others to buy it. All proceeds for this book are being donated to the survivors of the Queensland floods. Don’t forget to read my story!